Arcam AVR750 review | What Hi-Fi? Arcam’s AVR750 is a rare thing: a surround amplifier that sounds really good with music. While not perfect, it has cohesion and rhythmic precision that we haven’t heard matched by any rival. As is usually the case there’s no big secret ingredient here. Just a careful, holistic approach to sonic engineering based on Arcam’s decade’s worth of experience. Care over basics such as circuit layout and power supply can be taken as read, but the world of multichannel makes things much harder. Here, many channels of power amplification and an appropriately hefty power supply – both of which exhibit large currents, related magnetic fields and a fair dose of electrical noise – sit close to the preamp, digital-to-analogue conversion stages and various processing boards. It’s very difficult to stop the various sections interacting with each other adversely. It takes experience and skill to get it right – Arcam isn’t short of either quality. Even something as apparently simple as the volume control is carefully thought out. In the AVR750, it’s a resistive ladder arrangement – as seen on some higher-end stereo preamplifier designs – which only has a single resistor in the signal path at any one time. This approach improves clarity and reduces distortion. The power amplifier section is unusual too. It works in a mixture of Class A and Class G modes. Circuitry working in Class A mode has long been thought of as the optimum for sound quality but has issues in terms of high energy consumption and the resultant heat generated. Class G (something we rarely come across) modulates the power supply rails, depending on demand, to optimise efficiency – extra power is only provided when it’s needed. The AVR750, with its seven power amplifier channels (each rated at 100W output into eight ohms), would need heatsinks the size of a washing machine to get rid of all that heat if working solely in Class A.
Arcam’s solution is to use Class A up to 30W output and then switch to Class G when really high power levels are required. It’s a clever compromise that results in plenty of poke, lots of quality and acceptable amounts of heat. Arcam has also put a lot of effort in getting HDMI switching to work properly. It’s an area most rivals cracked years ago. The company’s earlier models were a little erratic in this respect, leading to plenty of frustrated users as the amplifier dithered while trying to lock on to a signal. We had no such problems with this model. It proved as stable in this respect as any of the competition, despite many attempts to get it to trip up. General build quality is good. The AVR750 feeling solid and well finished, but it’s not significantly classier than leading rival Yamaha’s RX-A3030, which retails for about half as much. If you’re after a truly high-end luxury feel you’ll be disappointed. Take a look at the on-screen menus and it’s clear that the engineers have tried to keep thing simple as possible, and on the whole this amplifier is easy to navigate as anything this complex is likely to get. The supplied remote is a decent affair with sensibly placed buttons and a relatively simple layout, but once again doesn’t feel like it belongs to a £4000 product. Try the iOS control app and it too is a mixed affair. The app is very informative as far as showing amplifier status is concerned. You’ll know exactly what kind of video signal is being received and the type of sound track it’s passing through. It’s a great analysis tool but lacks the user friendliness (and, yes, fun too) that alternatives from the likes of Pioneer have. That the amplifier is a little dim-witted when it comes to responding to commands doesn’t help matters. Others, even at far lower prices, offer a slicker user experience. 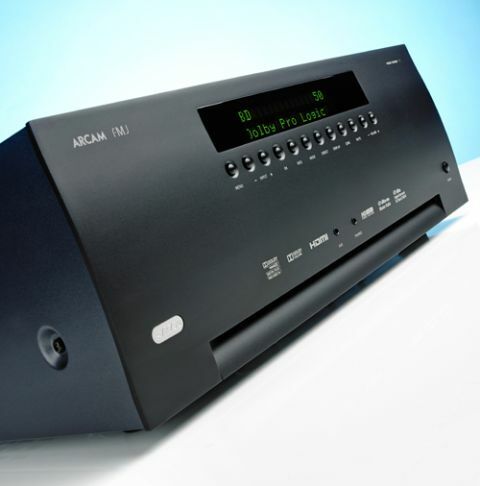 Get past these numerous niggles and it’s clear that Arcam has a sonic winner. If you want an all-round amplifier that plays both movies and music well, we haven’t come across better at anywhere near this price point. Play the action-packed John Carter with the volume cranked-up and the Arcam responds with glee. Home cinema amplifier manufacturers are notoriously free and easy with power output figures, claiming hundreds or watts of output even from their entry-level amplifiers. These power ratings are recorded under highly favourable conditions that barely hint at real world circumstances driving real speakers. Against this type of backdrop Arcam has been conservative. It claims 100W per channel output from its seven channels of power amplification – fairly similar to the kind of figures we see from typical £500 alternatives – but in use there’s no comparison. The AVR750 delivers high volume levels with ease, staying clean and composed even when pushed by large-scale battle scenes. There’s no hint of hardness or excess brightness. Instead, you get a stable and composed sound that wraps around the listener in a convincing way. Sounds move around between the channels seamlessly, and with precision. Most of all we’re impressed by the detail on offer, the Arcam revealing subtleties in the sound track few rival offerings would communicate. When we first listened, our initial feeling was that the Arcam, for all its insight, was a little small scale and a touch too polite. We’re used to top-end surround amplifiers having loads of attack and seismic levels of punch, and the AVR750 didn’t quite do it for us. That impression changes as volume levels rise. As we watch Michael Jackson’s This Is It we’re struck by the hide-behind-the sofa slam on offer during Smooth Criminal. There’s masses of punch here and a dynamic reach that leaves the cheaper competition well behind. Even more impressive, and arguably the AVR750’s star turn, is its rhythmic ability. Multichannel amplifiers, even the very best we’ve heard, never quite have the sense of rhythmic integrity of good stereo music amplification. By multichannel standards it’s little less than superb. The timing relationships between instruments and other sounds is maintained and delivered with a sense of momentum rarely heard from such equipment. This makes the music more exciting, and certainly more enjoyable. This skill also helps with movie soundtracks helping to build tension and drama as required. Switch to stereo music, either through the AVR750’s analogue inputs fed by Audiolab’s terrific 8200CD, HDMI from Arcam’s BDP-300 or on-board sources such as Network streaming, and internet radio delivers excellent results. We’d still take a dedicated stereo amplifier such as Naim’s Nait 5si over this Arcam if stereo music reproduction were our main priority, but for a multichannel unit it is excellent. The Arcam’s tonality is nicely judged and there’s a lovely balance between refinement and attack, whether listening in surround or stereo. Just keep the volume up and you’ll be in for a treat. If you want one amplifier to do it all this Arcam comes closer to that ideal than anything else we’ve heard at this price. It’s not flawless, but it is very good indeed.